Solar power is one of the biggest success stories in the american economy. At 260,000 workers strong it’s a rising force in US energy. The Midwest has seen explosive growth in recent years. Minnesota has increased solar production by a whopping 4,000% since 2012 to over 700 megawatts, providing enough energy to power 90,000 homes. On Monday January 22nd the Trump administration announced a 30% tax on imported solar panels and cells. Two failed US manufacturers brought a case to the US International Trade Commission in May of last year, seeking a tariff of more than 100%. The companies, Suniva and SolarWorld, are actually owned by international conglomerates based out of China and Germany respectively. The fact that “pro-business” Trump is effectively bailing out bankrupt foreign-owned companies, hurting more US workers than helping, and increasing prices for consumers, is the definition of irony. Are we sure this puts America first? Many rural communities have seen major re-investment in recent years. A billion dollars of construction is happening in many ex-urban Minnesota counties, the very counties that voted heavily in favor for Trump. Wright, Goodhue, Chisago, and Carver counties, where Trump won by huge margins, all stand to gain millions in increased tax revenue and economic impact. Land owners, many of whom identify as conservative, typically receive lease rates that are 2 to 3 times what they’d see from agricultural use. Solar will save the Red Wing School District (and local tax payers) 7 million dollars over 25 years – there are dozens of similar impacts happening across the state. The case has already had huge consequences. 2017 and 2018 were set for record-breaking industry growth, but since the announcement last spring that Trump was expected to impose tariffs, development and construction of solar projects slowed to a crawl. Large companies purchased nearly all tariff-free panels available which squeezed smaller installation companies and distributors struggling to complete jobs. Investors were hesitant to finance what was seen as an unknown tax risk. The country installed just 12 gigawatts of solar in 2017 (estimated) compared to 15 gigawatts in 2016. Trade is complex and solar is no exception. 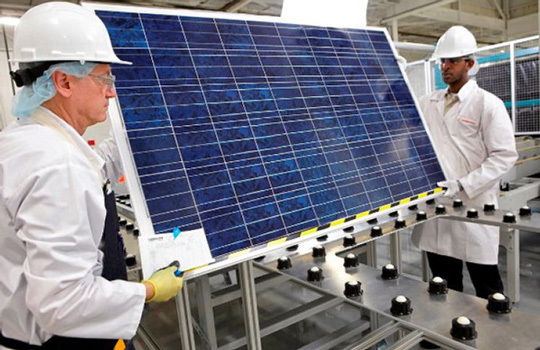 Most panels are manufactured abroad, and the cost of those panels has plummeted more than 90% since 2007. Whether prices are truly being manipulated or a result of more efficient processes, much like the cost of computing power over the same period, is difficult to discern. US consumers rely on affordable imports for everything from cell phones to TV’s to cars – and protectionism hasn’t overwhelmed any of those industries. It’s still unclear whether or not NAFTA countries are affected by the ruling. Many solar projects utilize panels made in Canada and Mexico, including a company with Minnesota ties – Heliene. Heliene was part of the now retired Made-in-Minnesota program, and has facilities in Mountain Iron. Based on the tariff, they are seeking to expand those operations which could bring much needed dollars into that area of the state. Is this the end of Solar? Impacts overall will most likely be muted. With no poison pill for the industry, and a reasonable sunset to the tax, a 30% hit is a speed bump and not a car wreck. Markets adjusted to the impending tariffs with significant panel price increases (~25%) in 2017 due to lack of inventory. As the issue cools off it’s expected that panel prices may increase marginally. With this tariff issue and Trump’s tax policy out of the way, certainty will restart the flow of project development and construction. Short-term contraction for a long-term trend that looks bright. Unfortunately clean energy and climate change are inexorably linked, and thanks to a certain former vice president politics have entered that equation. Trump’s commitment to coal miners, via this tax, is coming at the cost of thousands of workers from both sides of the political aisle. Traditionally, conservatives have taken more of a free-market approach with limited government intervention – this instance seems counterintuitive. The U.S. Bureau of Labor Statistics said solar would be the fastest-growing occupation in America over the next 10 years. In order to realize that statistic the country needs to set aside ideology and realize that our future stands with solar, tariffs supporting 2,000 jobs are simply not the answer. Its unfortunate that climate change is looked at as a burden instead of a great opportunity for America to lead the world in clean technology. This entry was posted in IPS Solar, Solar Industry on June 2, 2018 by Kyle Wehnes.